It is a series of 36 creative views that are arranged to display the story about the eye-catching beauty of Mount Fuji. This artist made use of Prussian blue ink, foreign pigment and many catchy colors over woodblock print to lead the stunning impression. Millions of Hokusai art for sale in Japan for a long time and later this artwork also grabbed the attention of artists from other corners of the world. Even today, you can find this creative painting in many museums at different corners of the world. Another creative work of Hokusai displays the simplicity and gestural quality of Cranes. This artwork is completed with elegant postures reflecting various movements of these lovely creatures. If you view Katsushika Hokusai paintings closely, it will connect you to the deep sense of the relationship between form and gesture with the creative representation of the life of birds. This painting got huge attention from impressionist around the world and can be still found in many museums. During his complete lifecycle, Hokusai has created so many artwork series and each one of them reflected the unique concept from his imaginations. Whaling off Goto is a popular artwork in the Ocean of Wisdom series that displays a large whale in the painting and it is surrounded by various whaling boats. These series has few paintings on woodblock prints and they create an ultimate impression on viewer’s eyes. In a very creative manner, this artwork showcases an impression of photographs where the frame cuts of some parts of the painting in a creative way. In the year 1811, Hokusai started developing sketchbooks with attractive images. These books played an important role to attract more students to his art school. The 12 different volumes of unique sketches were inspired by routine life scenes and the Hokusai Manga was one of the most loved printed works of his lifetime. These art pieces worked like an inspiration for today’s cartoon world in Japan. This art piece is quite different from the other artworks of Hokusai’s life. It is full of vibrant colors and the details are highlighted in a very impressive manner. 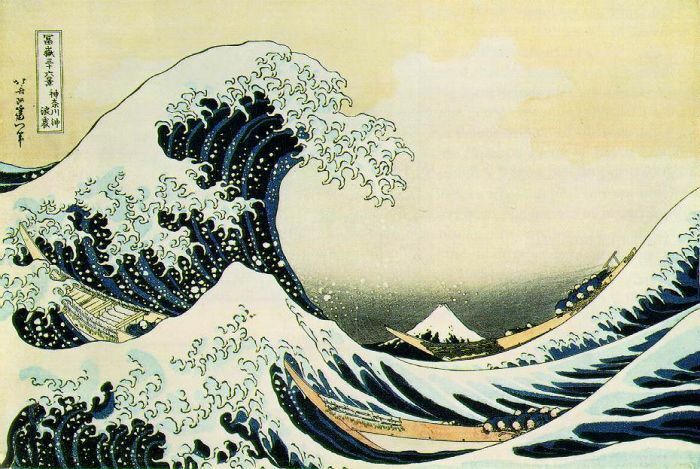 This awesome artwork is said to be the most famous wood cut design of Hokusai. The list of impressive Katsushika Hokusai artworks is never ending and each art piece in this list showcases unique message to their viewer’s eyes. Hokusai used several creative techniques to display his skills via paintings that are why is still remembered as a legendary artist of Japan.